Just got Lily and Billy Winter stamps in the other day and this is the inking!!! This was a challenge layout that I thought would fit this stamp. It did not qualify to enter into the challenge since I used a stamp other than Pink Cat, but I totally love this layout and card!! I also used SU Season of Joy to Versamark the background on the base card. I then went back over it with Spica turquoise glitter pen and white gel pen for the same background. I used Copics to color in the image and outlined it in Copic Wheat to make it pop. 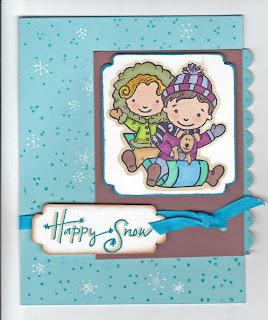 The Happy Snow is from Stampendous. I did a little detail with an ultrafine pen on the image. Finally the SU Horizontal Slot punch hold the turquoise ribbon. I love the scallops hanging over the side! And I really like that stamp too!! !